Courage Marine: White candle day. On 15 Sep, I asked, "Is Courage Marine awakening? If the resistance at 19.5c is taken out convincingly, it could very much be the case." Today, this took place on rather high volume. Of the 3,882 lots traded today, 2,999 lots were buy ups, of which 2,172 lots were buy ups at 20c. Could the remaining sell queue at 20c be mopped up tomorrow? Perhaps. The MACD is rising in positive territory signalling a return of positive momentum. 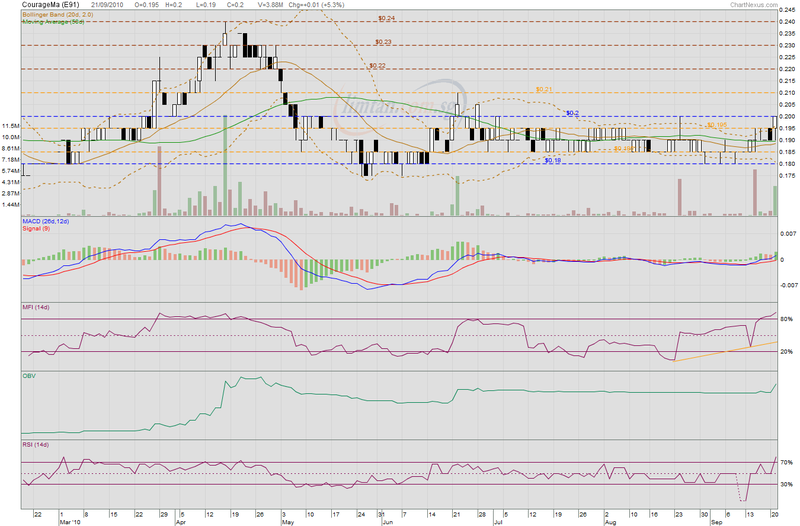 The OBV shows a sharp move upwards suggesting increased accumulation. 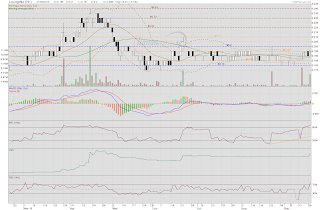 The MFI formed a higher low several sessions ago and has risen into overbought territory. The RSI has the same trend. Demand and buying momentum are both positive but seeing the indices being in overbought territories sends a cautionary note. Any upside could be limited. If 20c is take out, the next resistance could be at 21c, the high of 22 Jun 10. However, in exceptionally bullish situations, both MFI and RSI could stay overbought for much longer. Could it happen in the meantime? It could but it does not seem very probable. Courage marine is a thinly traded stock, so TA may not be that effective..but volume has broken out and prices closed just out of the bb. The next significant resistance I see is 0.21, the high on 21 June.